The GUI before I knew GUI was a thing. This is GUI Zero. 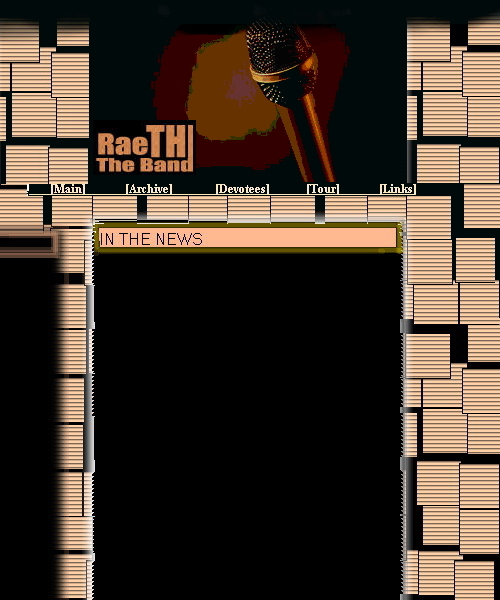 This was a mock up I made to convince a client to let me make his bands website. Looking at this now over a decade later, I recall the research I went to various musicians websites and saw how they ran their websites and based my composite. I had not studied any HTML or UI design techniques back then but I still followed standard practices such as a header image, horizontal nav bar, left a side (for categories) and a centered body. It makes me almost feel as if I was born to do UI/UX. The file creation date states that I made this on August 19th 2002, however the software I used to make this with ACDsee FotoCanvas 4 was not released until Dec 2003. Therefore the earliest I could have made this would’ve been 2004. I remember I took some computer graphic summer courses in 2002. I got a quick intro to Macromedia Freehand and Adobe Photoshop. I could not understand how to use a Pen Tool (something I struggled with until until Q2 2016). I also found the layer system in Photoshop infuriating. Eventually sometime in 2004 I discovered FotoCanvas and found it more advanced than MS Paint and more user friendly than Photoshop.